PhabrOmeter® instrument, a fabric sensory quality evaluation system, developed by Nu Cybertek, Inc. in California, USA, and has become a designated machine by AATCC standard for fabric hand evaluation. PhabrOmeter® system measures the “feels and looks”, or so called “sensory perceptions”, of such sheet type fibrous products as woven and knitted fabrics, nonwovens, paper products, leathers and others in contact with human skin when in use. Sensory perception has long been considered one of the most important quality attributes for such products and yet difficult to test using instrument. 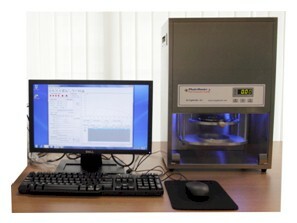 PhabrOmeter® system consists of an instrument and a software package. The system is based on the pattern recognition theory, by extracting the quality characteristics of the product, and connecting them to the human sense, so as to provide fast and reliable quality evaluation results. It fills a very important blank. Wrinkle Recovery Rate - an indicator on how well a fabric recovers from a wrinkled state. Drape Index - a parameter measured to represent the fabric drape behavior. 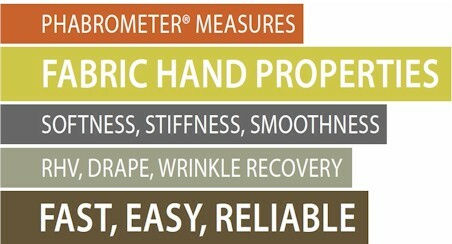 We provide PhabrOmeter ® system - a complete fabric hand evaluation system, to the various industries worldwide. PhabrOmeter ® instrument is the AATCC designated instrument. It is accurate, reliable and easy to use. It gives user quality data including: relative hand value against a reference fabric; other fabric hand attributes; drape coefficient, and winkle recovery rate. All data saved in data¬base for future use. For textiles manufacturers, suppliers, finishers and garment manufacturers, PhabrOmeter ® system will help find your direction to improve product quality and enhance the true value of your products. Affordable price and good tech support. For more information, or to request a quotation please E-mail us at: sales@nucybertek.com.